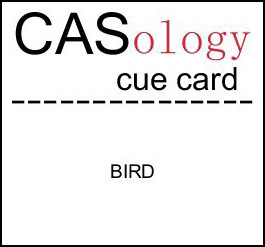 I wanted to show you this week that a CAS card does not have to be white. I didn't use any white on my card this week but I allowed my one layer focal panel to have lots of open space. The card itself can be put together easily but for me it is the design process that is more time consuming. The birds are from Melissa Bickford's Tweet Talk stamp set and the sentiment from Heart-2-Heart #3. Both can be found a Papertrey Ink. Instead of using white I creating this clean and simple card using Ripe Avocado and Kraft. I can't wait to see what BIRD means to you! LOVE these pops of colour on the craft - a good reminder that white space doesn't have to be white! ANOTHER adorable card....those little birds are just the sweetest thing! 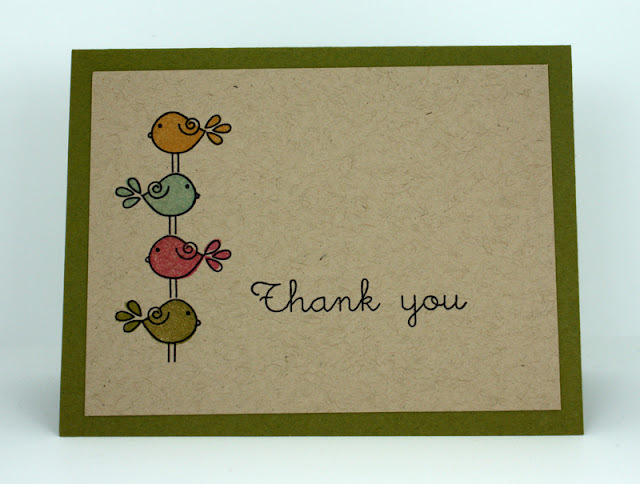 Love your sweet little stack of birdies on that yummy Kraft card! So cute Tracey. I love the colors you uses. oh my- love those little birdies!! Lovely card, your birdies are so cute. Oh MY goodness this is TOO cute Tracey! LOVE the colors on your fun stack of birds. They look great on the kraft background. your little stack of birdies is soo cute, tracey!! lovin' all that "kraft" space, too!! Oh how I love the pops of color on kraft. Stunning! Love the simplicity of this card! Beautiful! Hi Tracey! This is SO cute! I love the colors - they remind me of Fall. And I love the new look of your blog, BTW!! Thats an unbelievably cute card! For some reason I always thought of CAS as _white_ spaces. Glad you changed my thinking with a kraft CAS card! and I have to say I'm so glad you used kraft!! I love the kraft background!! Your stack of birds is so sweet!! Such a sweet thank you card! I love these adorable bird images! Oh, this iis one of my favorite inspiration cards this week...a perfect clean and simple card! Love the birds, cute designs all around! Tracey, these sweet little birds are just so adorable. This is another set I do not own but now feel that I need to have it...thanks for the inspiration! This is so cute! The birds just pop on the kraft background. Everything looks better on kraft, and I love these adorable little birds! Cute card! Love these sweet birds all stacked up ~ so very CAS! I'm a big fan of things stacked on top of each other ... they look great on kraft too! Good idea to use something other than white now and then. Tracey, this is such an adorably SWEET card! I love the stacked birdies. Tracey, I've selected this DARLING card as one of my favorites for the CASology Favorites Week. I love the SWEET birds on kraft...AND the design is fabulous.